In class, we began discussing failure in video games. The most common version of failure in video games in gameplay failure. Gameplay failure is when the player fails to complete a task that he/she must complete in order to progress in the game. This could be failing to solve a puzzle (e.g. Portal), dying to enemies (Halo), or even losing a match against an opponent (League of Legends). I will breakdown the evolution of games over time and show how failure in video games became less harsh and more importantly, different. Thinking back to early video games, we have to look at the arcade genre. Because of the video game infrastructure at the time, these games were meant to be played at an arcade, not in your home. As such, these games were meant to be played for a few (but possible several) minutes at a time to allow for others to have a chance to play as well. Thus, the games had to be developed in such a way that allowed for meaningful gameplay progression, but also had a “hard-capped” end. For example, Donkey Kong allowed players to play the game for as long as they could, while they still had enough lives left. Of course, the game increased in difficulty and most players could never really play too long. As companies began developing in-house consoles, like the NES, the gameplay paradigm followed. Many games for the NES still had a very “hard-capped” ending. Super Mario Bros., for example, had a similar structure to Donkey Kong. The player could progress as far as he/she wanted until they ran out of lives or beat the game. Having played the game myself, it is very disheartening to see yourself progress really close to the end, and then lose your last life. That’s it. Game Over. Now restart from the beginning. As technology grew in the 90s, games could become more sophisticated. Developers could begin creating non-linear story lines and program 3 dimensional worlds. Take the Nintendo 64 games for example. Banjo-Kazooie and Donkey Kong 64 both became more forgiving when a player failed. Simply getting hit by an enemy didn’t mean death. Players began having health pools to take more than a few rounds of damage. Players also still had multiple lives. However, these two games in particular still had “Game Over” screens when a player completely died for the last time. (here is one for Banjo-Kazooie). As you can see, these game over screen are very disheartening and showing the player the results of their failures. Fast forward another 10 years to the 2000s and even today. Technology has allowed us to put more content in games than ever thought imaginable. This new emphasis on content and story-driven games allows developers to be extremely forgiving with gameplay failure. This is mutually beneficial for both players and developers. The players get to continue their game without harsh penalty while also getting to access all the cool content that the developers spent millions of dollars on. It only makes sense, right? Why would a company spend that much resources on game content if the punishment for for gameplay failure was never getting to experience any of it? Nowadays, with huge thanks to advancement of technology, failure is almost irrelevant because of the willingness for developers to be forgiving and the perseverance of players in order to progress in those games. GAME OR BUST. Probably Bust Though…. In King of Kong – A Fistful of Quarters we witness the underdog, Steve, tackle the task of getting the world record score in the arcade classic Donkey Kong by practicing for hours a day and performing under pressure. The other side of the story shows a demigod of the arcade world, Billy, as he constantly displays a smug grin while maintaining his super star status from the comfort of his home. It really is a great story of a clash of titans that have mastered their craft to an uncomfortable level. By the end of the story, Steve’s works pays off and the audience is left with the knowledge that he successfully holds the top scores on Donkey Kong (live and recorded). Everything is right in the world – Billy and his goons don’t come out ahead, and the audience can stop feeling sorry for Steve. But what if he didn’t get the record? What if he just failed and I was just left there….cringing and feeling sorry for Steve, his wife, and his kids? Well, if that happened, Steve’s story would be like thousands of gamers around the world — thousands of gamers in the United States that all play the same game: League of Legends. League of Legends is a notoriously addictive game. It has everything it needs to capture gamers and keep them playing the game. One of the biggest features of LoL is the immense professional scene that allows top gamers to make salaries and become famous like Billy Mitchell. But unlike Steve, most League of Legends players will never come close to becoming professional because they lack the work ethic and skill. The saddest stories are the players that come close to making it and end up failing; they put their money on the line, they move to a gaming house, take off college, and walk away with nothing…their dreams shattered. For young players that is a huge fear when trying to become the best. In Steve’s case, not as much was on the line, but he was clearly obsessed and had the risk of walking away as a failure who threw away valuable time. Games can consume so much of an individual’s life. From the hours spend casually, to thousands of dollars gambled on the opportunity to become do what you love most, professional gaming is risky. When watching King of Kong, I couldn’t help but imagine the Steve that could have been: a sad, broken dude who obsessed over an arcade game. Steve is more than a character in a great documentary. He is a vivid example of what it takes to be a professional gamer; it’s hard; it requires countless hours of practice and dedication; you have to juggle real life with your dream; the chance of failure is high. In the end, you might fail….or you could play video games for a living….which is rad. Author tonyosoPosted on September 5, 2014 September 5, 2014 Categories UncategorizedTags Donkey Kong, Gaming, League of Legends, professional gaming, Swag, World RecordsLeave a comment on GAME OR BUST. Probably Bust Though…. 1. Subject matter: many critics disliked the movie because they found the topic of video games inaccessible. Ann Hornaday, a film critic for the Washington Post, opens her critique with the question “what is more tiresome than watching somebody play video games?” This type of critique has nothing to do with director Seth Gordon’s movie making ability or the strengths/weaknesses of storytelling, but dismisses the film for its subject matter alone. While I don’t think this is a very salient argument, Hornaday does have a point: King of Kong will most likely not attract non-gamers, regardless of the actual mechanics of the story or art of the film. 2. Unoriginal themes and “lack of depth:” Hornaday criticizes Gordon’s “all too familiar formula” and says that the film’s “structure … has become increasingly hackneyed with the glut of competition documentaries” (She cites Mad Hot Ballroom and Spellbound as probable inspiration for Gordon.) Other critics think the film relies on stock characters and overused themes which make the film one dimensional and unoriginal. Blogger Paul Dean agrees that the story is a simple “story about good pitted against evil.” However, Dean doesn’t think this is necessarily negative, but rather essential to writing a compelling story about video gamers, which most of the world is unfamiliar with. These types of critiques struck me because they were extremely similar to the type of critique that Lord of the Rings (and the fantasy genre) typically receives: either people can’t connect with the subject matter, or they find the themes elementary. I had not thought of King of Kong as a “fantasy” because of its documentary quality, but now I’m not so sure. Examined under the same critique of fantasy, it appears that Gordon does prey on elements of fantasy storytelling to create his film: he sets up an unfamiliar world, describes the rules of that world, and forces the audience to connect with the characters despite their unique reality. King of Kong: Fistful of Quarters is not a fantasy film, but it invites the audience into a sort of virtual world. To do this successfully, the filmmakers used techniques of fantasy storytelling, and thus are met with similar criticisms. For me, this was an awesome exercise in the possibilities and limitations of genre (documentary, fantasy) and I’m curious to see how some of these critiques are either dodged or manifested in other mediums (film, written narrative, video games) as we move through the course. The characters overall struck me as pathetic and childish. 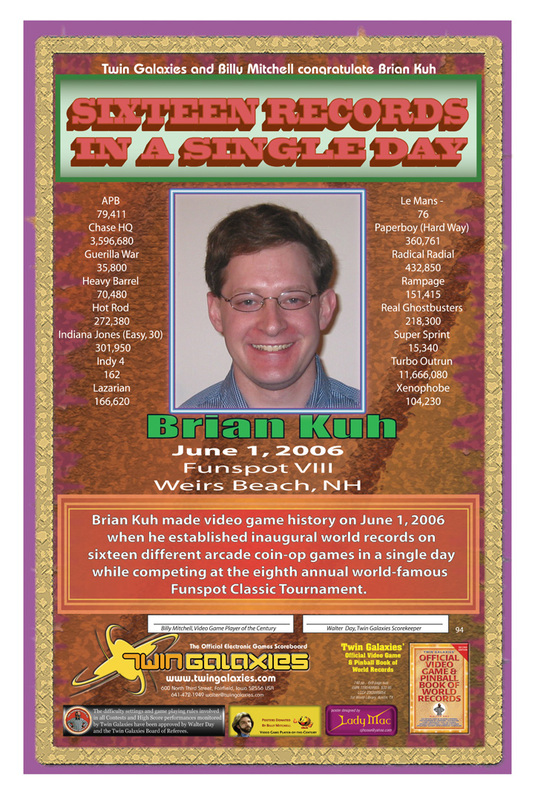 Specifically, the most pathetic characters were the supporting characters to Billy Mitchell specfically, Brian Kuh. I felt so bad for him that he was being used by Billy Mitchell as a go between to tell him Steve Wiebe’s scores. He seemed like a little minion and all he wanted was to get to the end screen and even in the end he did not get to the end screen by himself and the great Billy Mitchell was supposed to be teaching him. I didn’t like that Billy Mitchell could see the videos of Steve Wiebe playings and getting to 1 million and he probably used that in order to “beat” Steve’s score. The relationship that Billy Mitchell had with Walter Day made them quickly accept his score and that whole experience was problematic with me. Also, the childishness of the Billy Mitchell calling his friend and not going to eat at a certain restaurant because Steve Wiebe showed up. Overall, the World of Arcade gaming to me seemed childish with a bunch of grown men and women fighting and partnering up like small children on a play game. I am not sure if this is a accurate portrayal of the gaming arcade world or if it is just how the documentarians chose to show it. However, that is what I felt about the world of gaming after experiencing King of Kong: Fistful of Quarters.